The Annual Balloon Release has been moved to coincide with the Country Connections weekend. 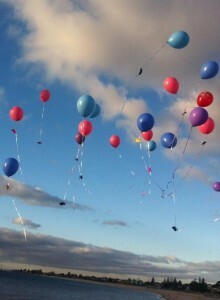 The balloon release w ill be held on Sunday, 23rd April at 1pm. All parents and siblings are welcome.We’d love to see you there! Please see our facebook page for late changes to the event – it seems we are harming the environment by releasing balloons – this is certainly not our intention so the committee will revise the plans for the event and come up with another way to acknowledge our precious children.